High Lift Jack & Other Vehicle jacks. Every vehicle is released from the factory floor with a jack, however the normal car jack will be useless on any soft surface and if the 4x4 has a lift kit it will more than likely be too short to even lift it, adding bigger tyres and the jack may not even reach! 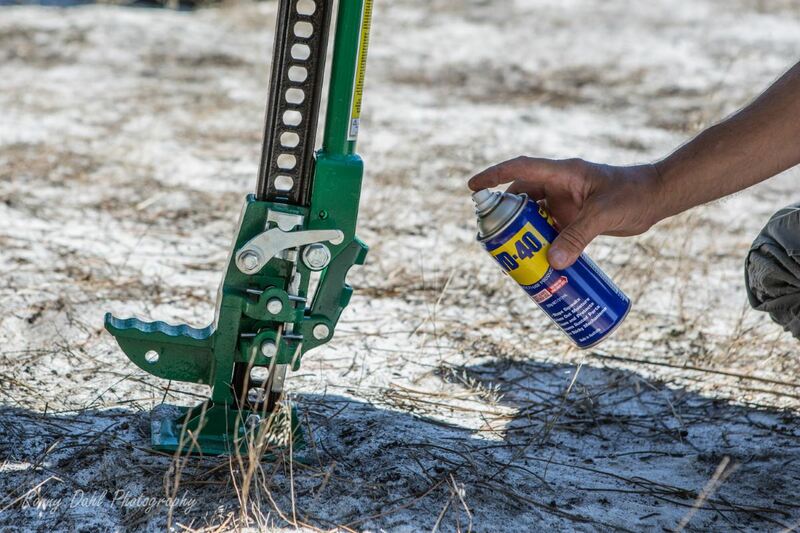 The best thing to buy would be a “high lift jack” or “kangaroo jack” (also known as a “Farm Jack”); the other option is an “exhaust jack”. 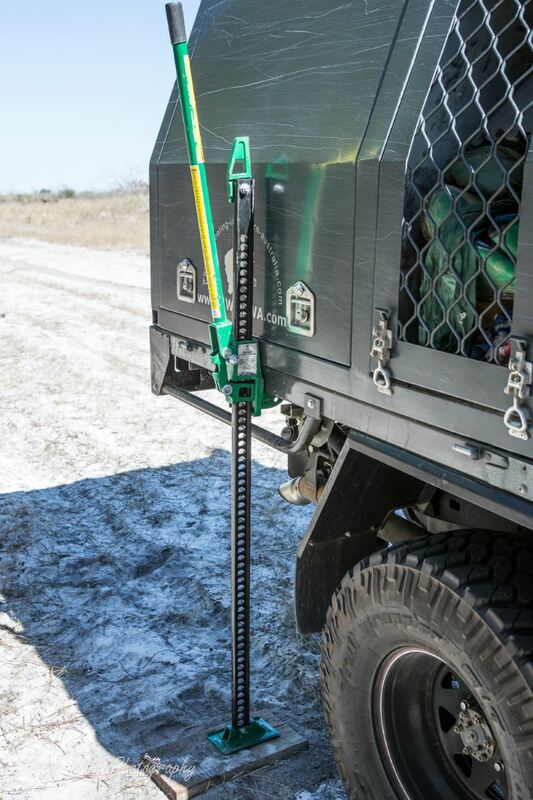 Even though this type of jack may not be very useful (after getting a lift kit) I would still recommend keeping it in the vehicle as they can come in handy when on uneven rocky areas. They can be placed in surprisingly handy places where any other jack might not fit. Given their size they are handy for some track repairs as well, bending panels pushing out wedged debris etc. This is a long heavy device which lift a vehicle from a lift point, the lift points are usually found on the bar work (bull bar, tow hitch and solid side step or rock sliders), if the 4x4 has no bar work a high lift may not be the best option. Keep in mind that not every bull bar or piece of bar work will support the jacks. 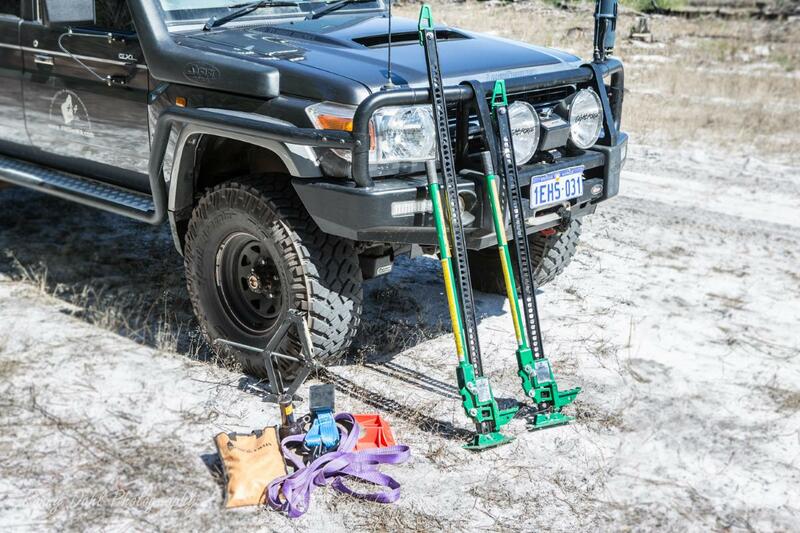 There are extra attachments available for high lift jacks, these include a bigger base plate for the foot of the jack (the narrow foot is unstable the best of times), lifting hooks and extenders for the lifting tooth (lifting tooth as in the part of the jack which lifts the vehicle). These jacks are also handy for bending and straightening damaged steering arms and pulling the weaker bar work back into shape. To do this kind of repairs requires a bit of creative thinking and some high lift jack attachments/accessories. Many people have these attached to the outside of the vehicle, if doing this I would highly recommend oiling it from time to time to prevent rust and so it’s in working order for when needed. The Exhaust Jack is a deflated rubber bag with a long rubber pipe, the end of the pipe is to be attached to the exhaust which then fills the bag with hot exhaust gasses. The hot gasses inflate the bag which is to be placed under the vehicle. The bag will lift the 4x4 up with ease. We recommend this to be a two man job as we found these bags to leak gasses once disconnected. A deflating bag which is holding a vehicle up is not a good thing if working under the vehicle. Have a second person to pump the bag up every time it starts to drop air. Also place the spare tire under the vehicle in case it should drop, slide or fall. Leave High Lift Jack And Go 4 Wheeling In Western Australia.